At a time when the most public face of country music can politely be called “conservative,” Mekons frontman and alternative-country voyager Jon Langford unearths the older, more weather-beaten face that gazes sympathetically on the problems and celebrations of working-class people. The expatriate Welshman and punk rocker admits he once had trouble seeing that face as a younger man. Not content to explore this world just within the context of the Mekons-the unorthodox punk rock group he helped to establish in 1977-Langford gradually organized the Waco Brothers and the Pine Valley Cosmonauts. Begun as larks after Langford moved from Leeds, England, to Chicago in 1991, these two loose collectives now form a distinct part of his back catalog and his current efforts. The Waco Brothers started as, and largely remain, a band meant to enliven a night of drinking and dancing at the corner tavern, though over the course of six albums-from 1995’s To the Last Dead Cowboy to 2002’s New Deal-they’ve developed a style that gleefully pairs the attitude of Joe Strummer with the sturdiness of George Jones. With the Cosmonauts, Langford has found a way not only to pay tribute to his heroes-with Misery Loves Company: Songs of Johnny Cash in 1995 and Salute the Majesty of Bob Wills in 1998-but also to engage in a fight against the death penalty. Through Tony Fitzpatrick, a Chicago-based artist best known for his Steve Earle album covers, Langford encountered members of the Illinois Death Penalty Moratorium Project and was inspired by their largely thankless work. Going against the grain is not new for Langford. The Mekons, after all, formed at the very apex of punk rock, when bands were constantly attempting to express their politics through their music. The Mekons took a different tactic. As the Mekons developed a larger audience, they eventually moved from the do-it-yourself ethos to various major labels. While this period in the 1980s generated some of their greatest albums, including 1985’s Fear and Whiskey and 1989’s The Mekons Rock ‘n’ Roll, it also nearly crushed them in a matrix of business concerns and executive decisions. By the early 1990s, they were at loose ends. Currently signed to the Quarterstick imprint of Touch and Go, a Chicago indie that has released most of their records in the last decade, the Mekons have capped their revitalization with Punk Rock, the album they put out earlier this year. Essentially a live recording, Punk Rock documents the band’s new perspective on material they’d written from 1977 to 1981. Songs like “Never Been in a Riot” and “The Building” have lost none of their primitive vigor. Langford has recently extended his explorations. In 2003, he collaborated with the Sadies, a quintet of Canadian alt-country stalwarts, on the slick Mayors of the Moon. This April he released his second solo album, All the Fame of Lofty Deeds, which utilizes the fictional Deeds as a phantom stand-in for both the country singers of the mid-twentieth century and Langford himself. From the ragged croak of “Last Fair Deal Gone Down” to the gallows grin of Bob Wills’s “Trouble in Mind,” Lofty Deeds tells a story of exploitation that would have been as familiar to Hank Williams as it is to Langford. Bloodshot Records co-founder Rob Miller certainly thinks so. Not content with being a forty-six-year-old man with a workload that would stun most people half his age, Langford is also putting together an artist-based record label of his own and trying out material with Ship and Pilot, yet another band with drummer Steve Goulding. On top of that, Langford is a painter and illustrator who does the covers for most of his own music and sells his art commercially to support that music. Then there is the matter of his family: his wife, the woman he followed to Chicago in the first place; and two kids, the main reasons he puts in all the effort for music and activism. A nostalgic homage to a time when Chicago was the unlikely capital of country music. Starting in 1924, the National Barn Dance hit the airwaves and became the most popular music show in the nation thanks to WLS and its 50,000 watts of broadcastiong power. 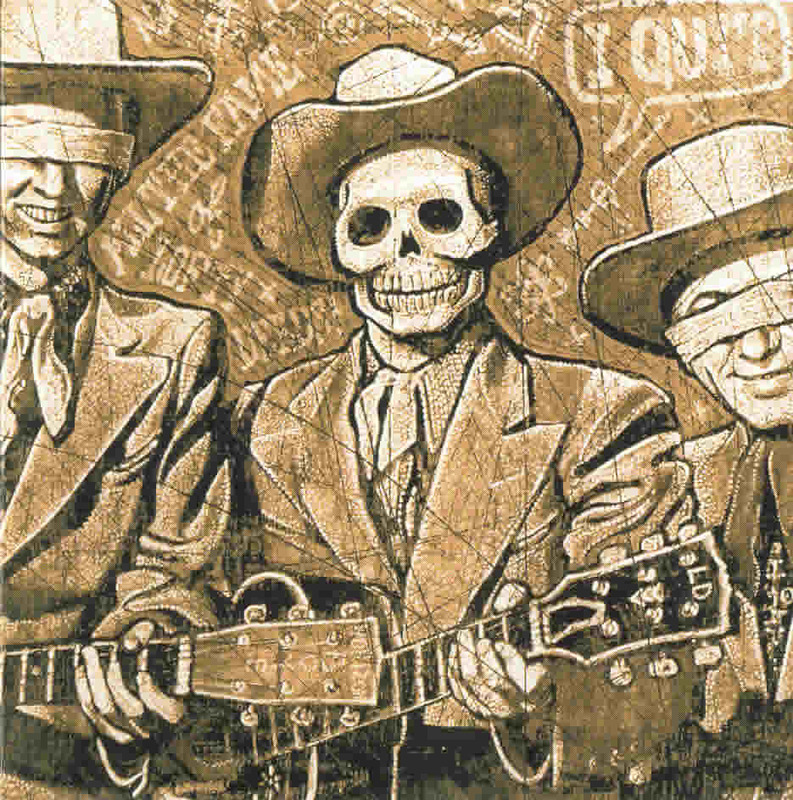 On this special limited edition CD(1500 numbered and signed by Jon Langford) the PVC celebrate Chicago’s glorious (and largely forgotten) country music history and the 36 years of the WLS National Barn Dance, America’s biggest Hillbilly Radio show from 1924 to 1960. Cosmonauts Jon Langford, Tom V. Ray and John Rice have enlisted legendary 87-year-old violinist JOHNNY FRIGO (city boy and jazzer who fell in love with Country Music when he joined the Barn Dance in 1948), plus regular guests Sally Timms and Kelly Hogan, as well as gold-throated new-boy Scott Ligon, to recreate those magical Saturday nights in the Old Hayloft when Chicago, not Nashville, was the capital of Hillbilly Music.